The thermal vents are found at various points along the riverbed over a 200–300m stretch of river, and they vary in temperature from tepid to scalding hot. The hot water from the springs mixes with the cooler water of the Douglas River so you can choose the perfect spot to get the temperature that best suits you. In addition, the large trees on the riverbank provide ample shade, so you can find the best spot for yourself, and just soak away the hours. The hot springs are certainly one of the main attractions of the area. 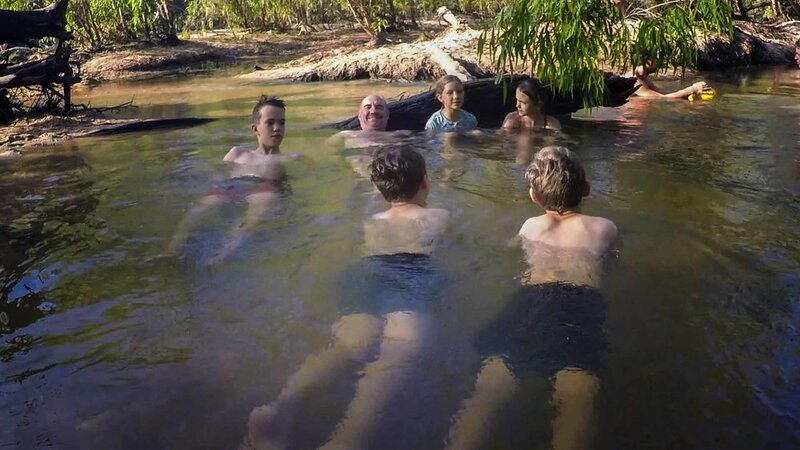 The large camping areas on the banks above the springs provide convenient access to the springs, although the camping area is part of Parks and Wildlife NT, and fees are applicable. Toilets, showers, water, picnic tables and barbeque pits are all available. The camp grounds do not have any powered sites but do provide a designated generator area. This is a popular camping site and can become crowded, although very few shade trees are available, and no grassy areas are to be found. Travel south about 26km after turning onto Oolloo Road from Dorat Road. Then turn left (7km) onto a graded dirt road and transverse one shallow river crossing before arriving at the campsite. This is a dirt road and does have a water crossing but should be accessible by most vehicles with moderate clearance. Trailers and caravans are permitted. Only open in the dry season. Wagiman women have sacred sites near the camp grounds; please refer to NT Parks Fact sheet in order to avoid these areas.